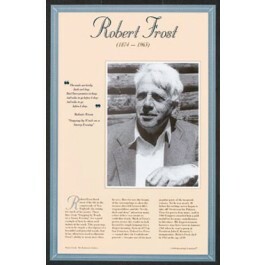 This unique educational poster of poet Robert Frost features a striking photo of him, as well as a quote from "Stopping by Woods on a Snowy Evening," and concise biographical text summarizing his life and career. 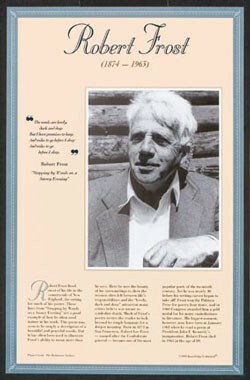 Robert Frost lived most of his life in the New England countryside, the setting for much of his poetry. The simple language of his poetry often hid deeper meanings about life. Frost won the Pulitzer Prize for poetry four times. This poster is a great way to introduce students to this quintessential American poet.